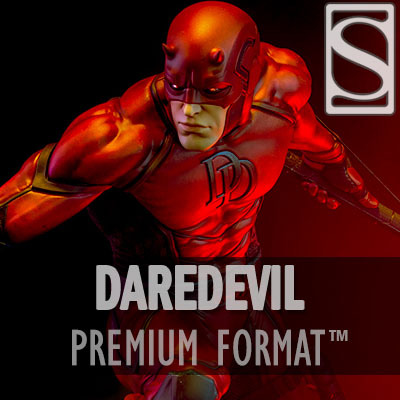 Better the devil you know- Sideshow is proud to present the Daredevil Premium Format™ Figure. Daredevil measures 21” tall above the rooftops of Hell’s Kitchen, lunging on top of a broken-window base inspired by the gothic architecture of the city he’s sworn to protect. The devil’s in the details- Daredevil’s signature red suit is sculpted with varied textures and panels, accented with black piping and a billy club holster. The sculpted polystone figure showcases Daredevil’s strength and agility, with detailed musculature and armor elements, giving the hero an updated look. Daredevil’s cowled, horned portrait is inspired by his modern suit style, as he focuses his super senses on the city below. The Daredevil Premium Format™ Figure includes a fabric elastic wire that can be used to connect the billy clubs in several different configurations on and around Daredevil’s arms. The figure can be displayed without the wire for an additional presentation option.